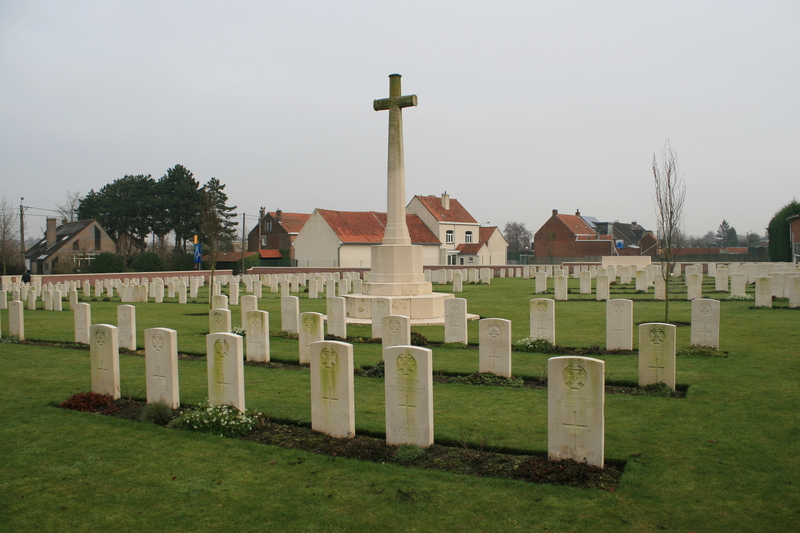 A couple of minutes drive east of Ypres (Ieper), along the road to Zonnebeke, the hamlet of Potijze, now an extension of the outskirts of the city along the N332, plays host to no less than four CWGC cemeteries. 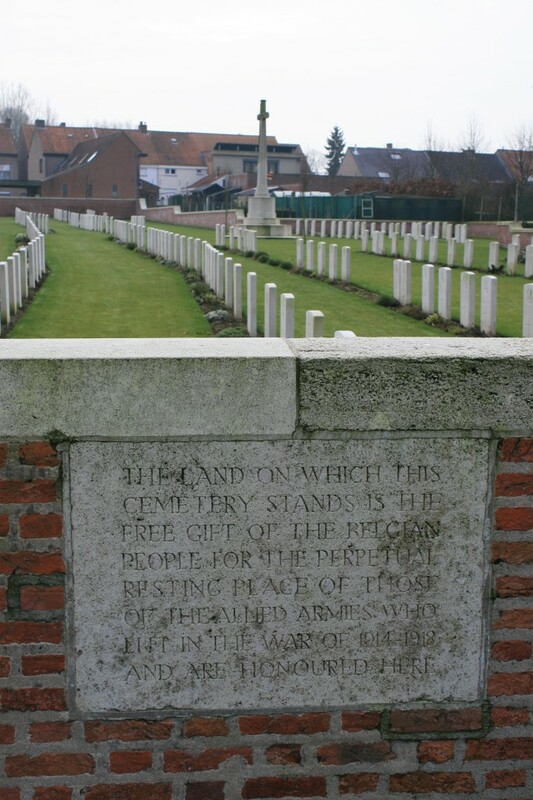 After the fighting of the first Battle of Ypres died down in November 1914 and trench warfare began in earnest, Potijze found itself just behind the British lines, and there it remained, within easy range of the German guns, for much of the rest of the war. It was from Potijze that men would enter the communication trenches that would take them east to the front line, and it was just up the road from here that an Advanced Dressing Station, set up in Potijze Chateau in April 1915 and in operation for the next two years, created the need for more than one burial ground in the vicinity. 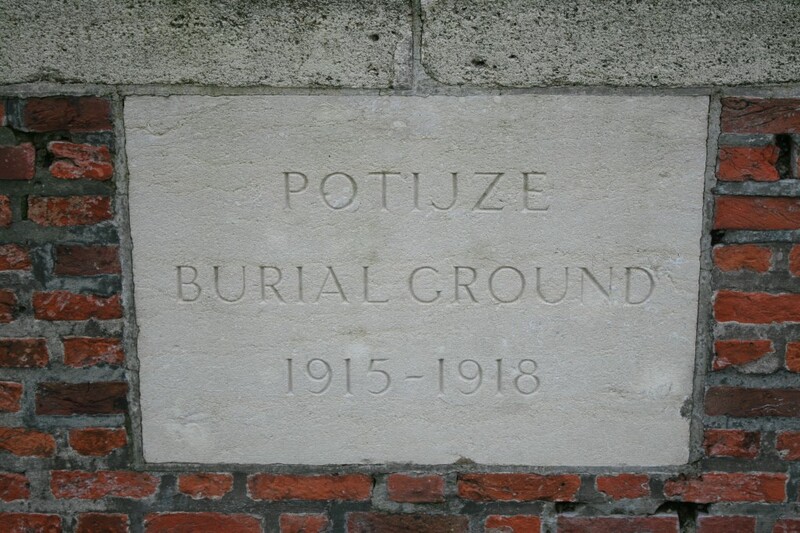 The first, and biggest, of the four cemeteries we shall visit on this tour is Potijze Burial Ground, or, according to the CWGC, Potijze Burial Ground Cemetery, where 584 British soldiers are buried. 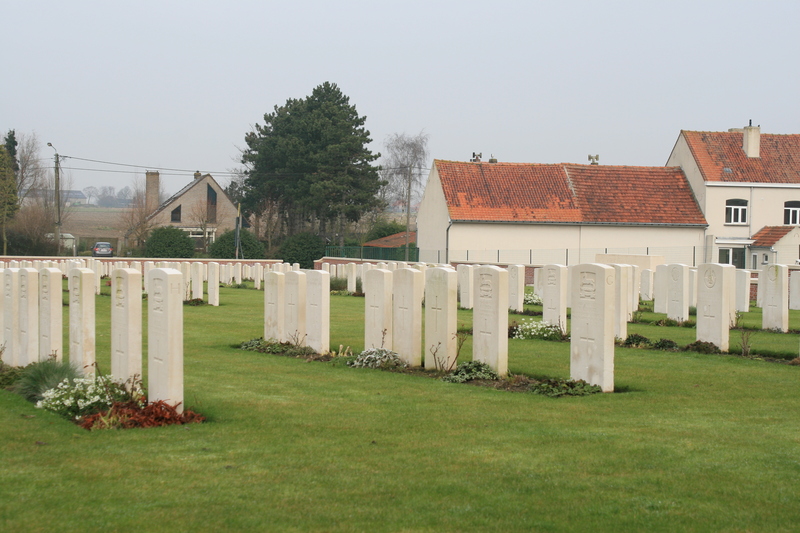 Curiously, as you will see if you peruse the cemetery plan (click the link below, courtesy of the CWGC), Potijze Burial Ground is not divided into plots, which for a cemetery of this size is most unusual. This view looks south from near the north east corner, the cemetery entrance being out of shot to the right of where we are standing. 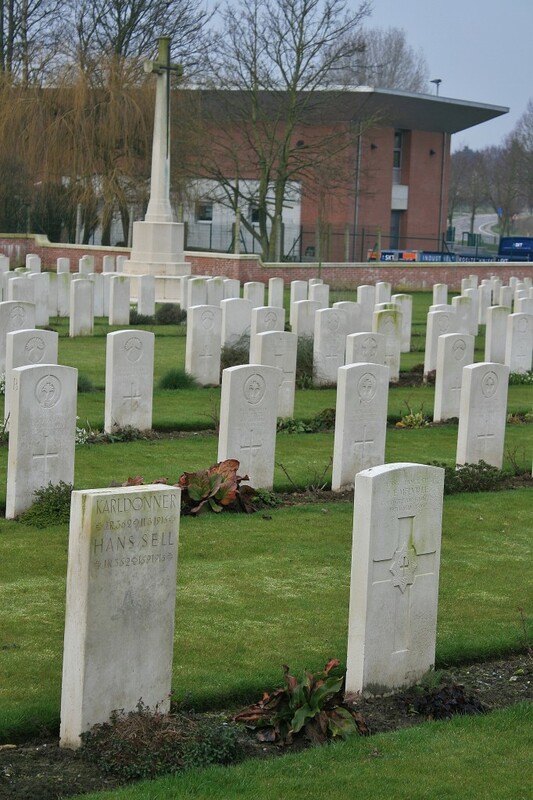 Note the two rows of touching headstones to the left; we shall visit them later. 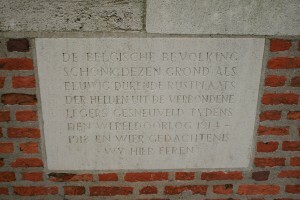 …after which it was used on a regular basis until the end of August 1916, occasionally in 1917, and just twice in 1918. 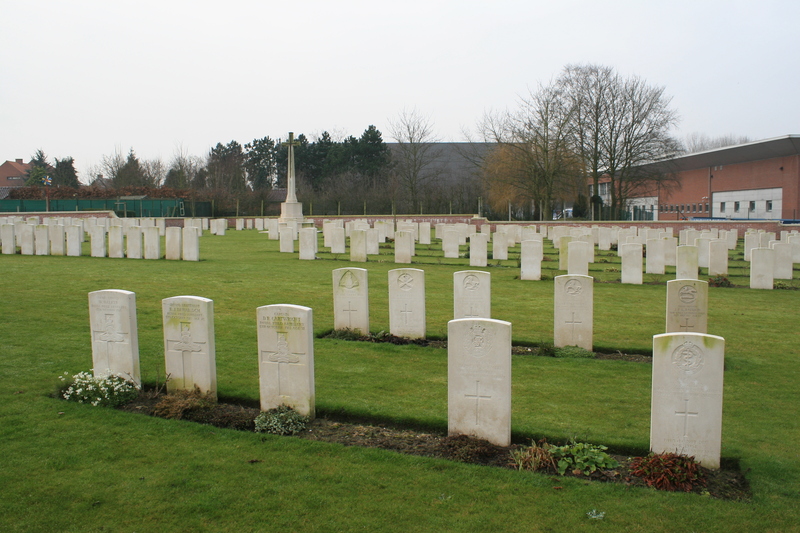 The King’s Royal Rifle Corps men buried in Row S (foreground), near the western boundary, were all killed in June & July 1916. 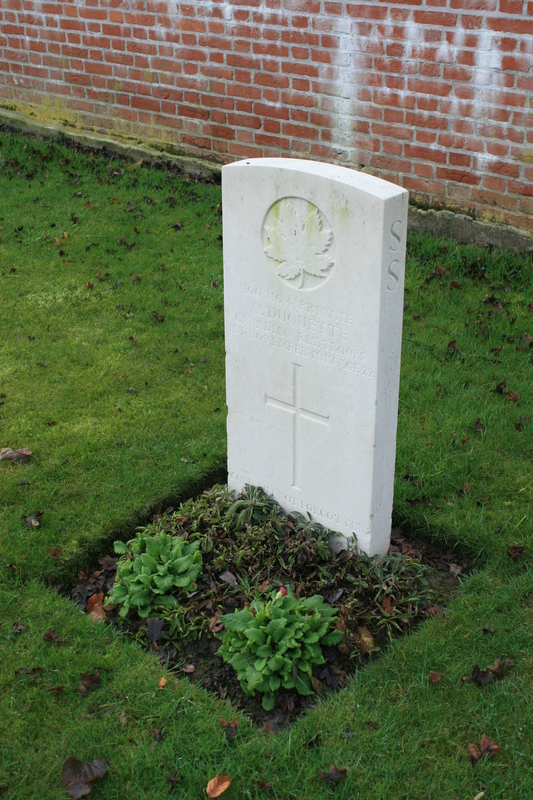 The only Canadian in the cemetery, Private Arthur Duquette of the Canadian Railway Troops died on 1st November 1917 and was the final burial made here that year. 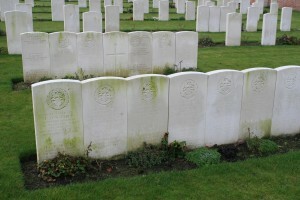 …and a closer view of the same headstones. The West Yorkshire Regiment (Prince of Wales’s Own) headstones in Row H (visible in both photos) are all casualties from February 1916. There are 21 unidentified graves in the cemetery, six of them together in Row G (above right). Views from the south east corner. 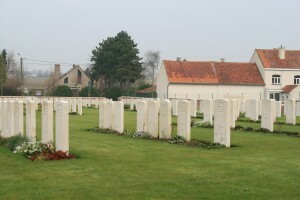 Two Germans lie in the cemetery, buried beneath a single headstone in Row A. 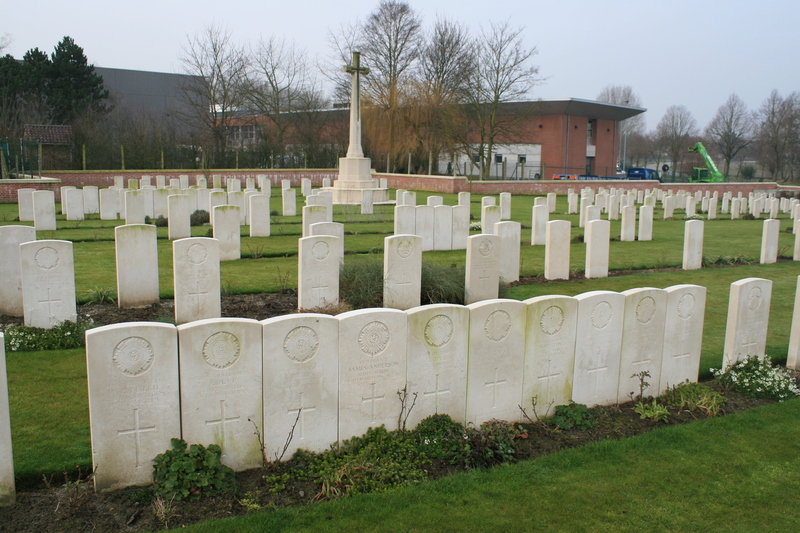 Note the Welsh Guards headstones from the spring of 1916 in Row B, and the plethora of Grenadier Guardsmen buried in the two rows behind. 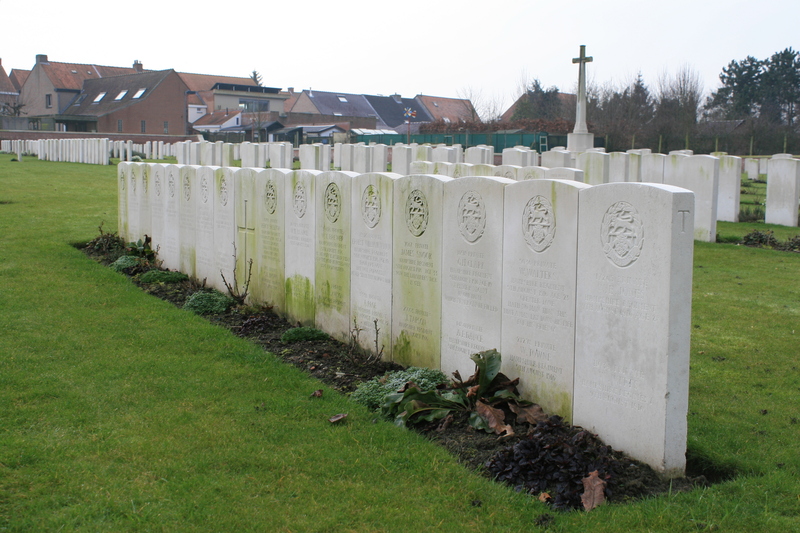 A row of Scots Guardsmen in Row C, every one of them killed on 30th March 1916 in the trenches at Hooge, about a mile and a half away across the fields to the south east, and buried in this mass grave. 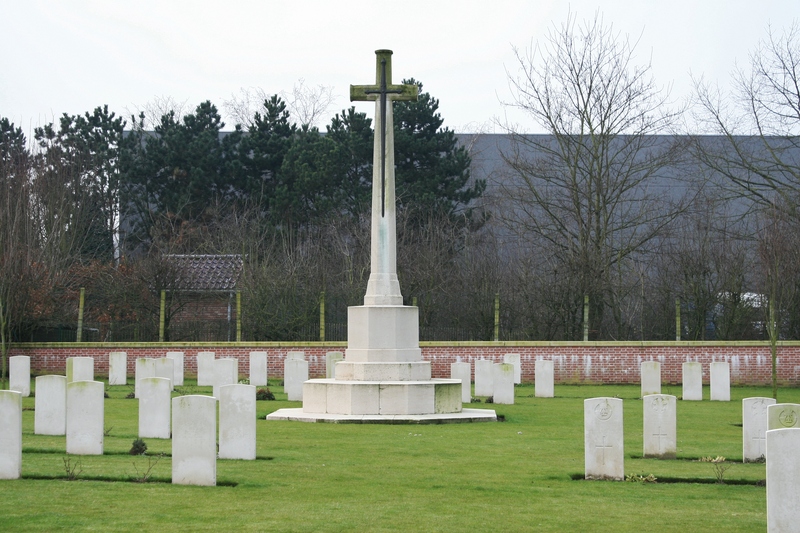 Altogether 29 Scots Guards died on that day alone, during a day-long German artillery barrage; total Guards casualties during March and April 1916 exceeded 750. 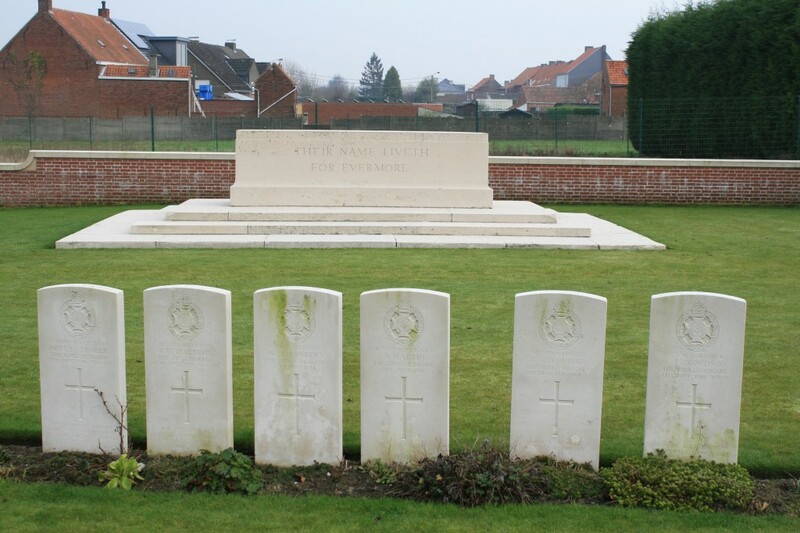 Six men of the Rifle Brigade, killed on 6th or, in the case of Rifleman Moses Storer on the far left, 7th June 1916, and buried in Row C in front of the Stone of Remembrance. 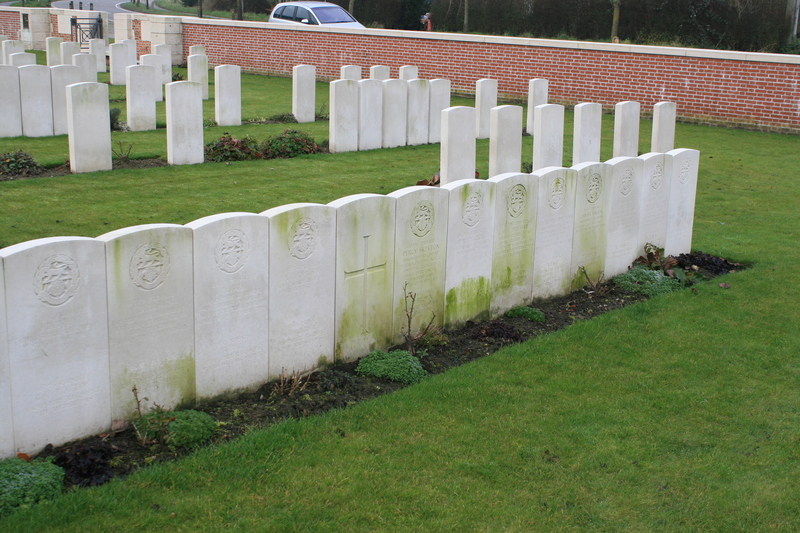 The headstone two from the right, that of Private Jennings, should, of course, be inscribed Rifleman Jennings. Rows M, N & O to the left, and Rows Z, A & B to the right, in front of the Cross of Sacrifice. 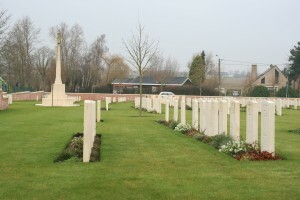 The final grave in Row M in the left foreground, that of Private John Wilson of the Royal Scots Fusiliers, is the only burial here from April 1918, indeed the only burial between November 1917 & October 1918, and one wonders whether he died of sickness, or was perhaps killed in an accident that occurred somewhere nearby. 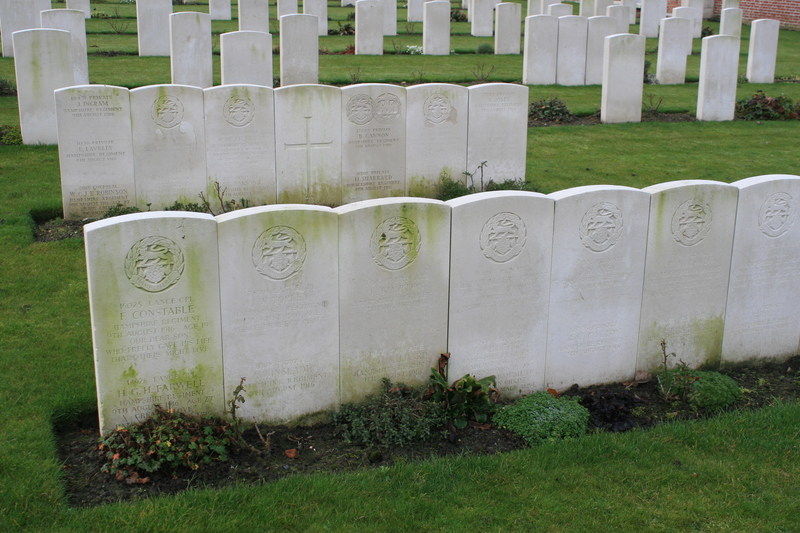 Row T. These seventeen headstones (the centre one bears nothing but a cross) are inscribed with the names of 32 men of the 2nd Battalion, the Hampshire Regiment, all killed on 9th August 1916. 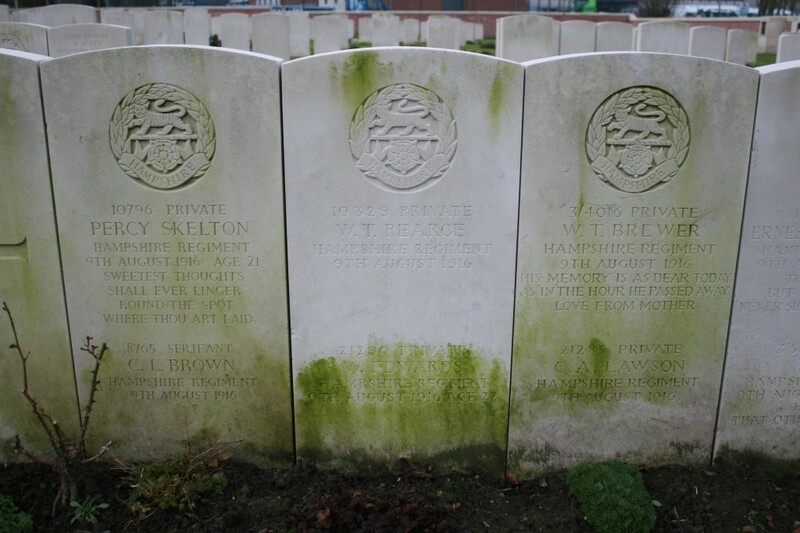 Behind, in Row U, lie thirteen more Hampshire men (and one from the Dorsets) who were also all killed on 9th August. In the early hours of the morning the Germans released a gas cloud which, slowly rolling across No Man’s Land towards the British trenches, engulfed the men manning the front and support lines, who appear to have been caught completely unawares. Many of the men who were killed were Hampshires who had survived the harrowing experience of Gallipoli the previous year, only to die in the choking clouds of phosgene that wallowed in the Potijze trenches that night, or in agony later, back at the Advanced Dressing Station in the Chateau. The Hampshire graves in Row T again, this time from the northern end. The Battalion casualties that night totalled 4 officers and 109 men killed, and presumably many more incapacitated. 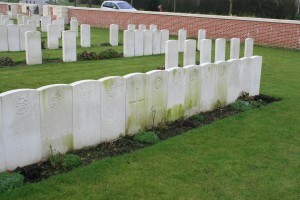 Close-up of three headstones in Row T.
Final view across the cemetery, this time from the north west corner. 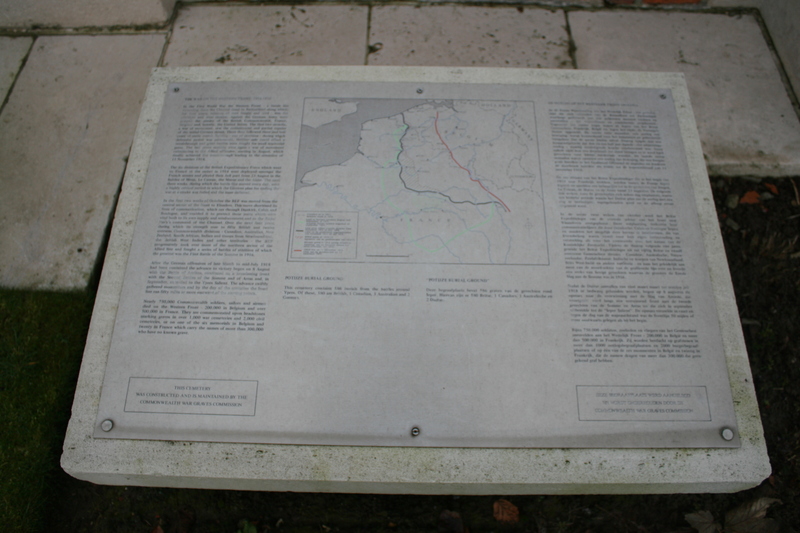 Back near the cemetery entrance, this information tablet (visible to the far left of the previous picture) gives a brief outline of the war on the Western Front. Plaques (above & below) inlaid into the cemetery wall bequeathing the land as the eternal resting place of the men buried within. 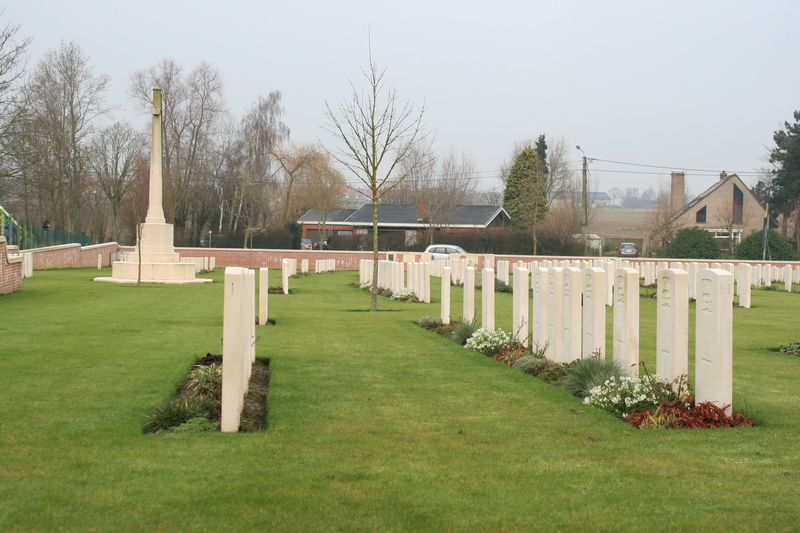 As we leave Potijze Burial Ground, four more CWGC cemeteries, and one French one, await us as we follow the road east. Re Private Jennings who should be Rifleman Jennings. A few years ago I had an elderly gentleman in my bosses office. Knowing my interest in military history he brought me an album of photos from his visit to his brothers C.W. grave at Ortona. I noticed that there was a thru and thru curving crack in the headstone from the top middle that ran 8-9 inches down. 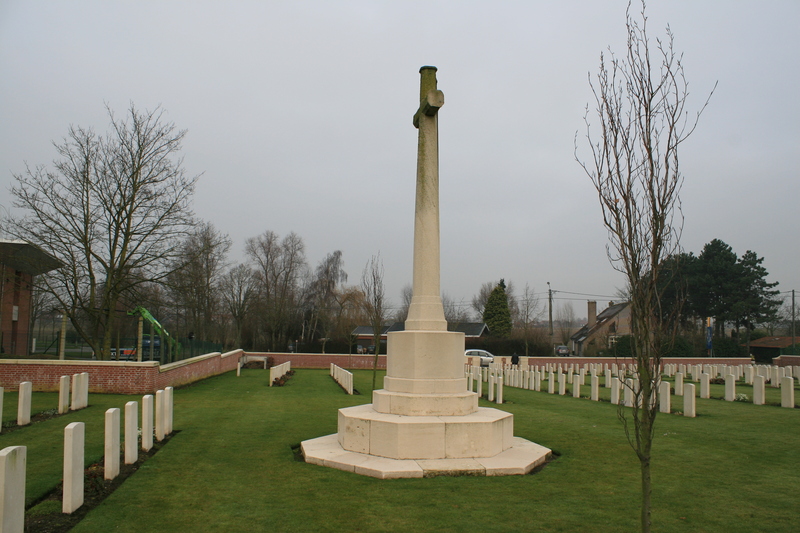 Late that day I emailed the Rome CWGC Office with the details. An answer was waiting for me from the CWGC Director of the entire Mediterranean Area first thing the next morning. He had already dispatched an engineer to inspect the stone. Seven days later I got a follow up that said the stone had been replaced. 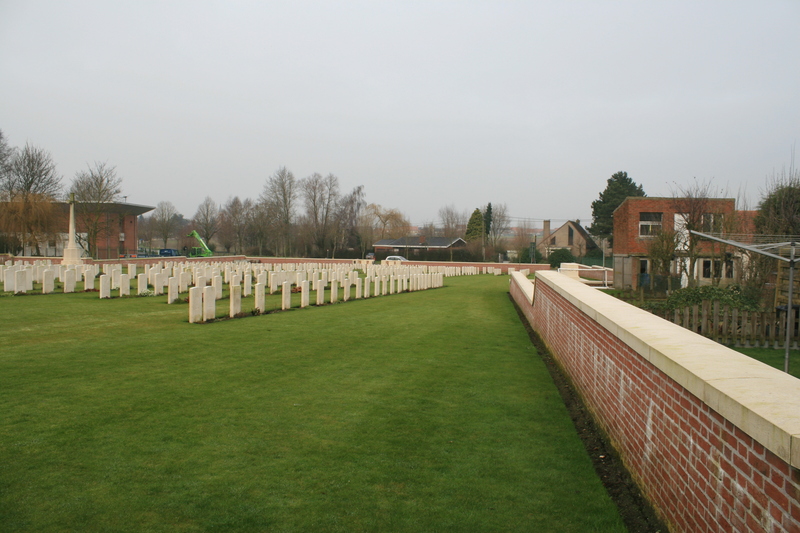 The CWGC staff are immensely competent and professional. Drop them a note, and even if they don’t do an instant replacement it will go on their records for the next refurbishment. Yes, my friend, I must do so; the CWGC are indeed usually very good at responding to such things. On a less positive note, I am not a supporter of any information panels at, or especially inside the CWG cemeteries like I see above. Just my opinion, but I think they disturb the simplicity of the cemeteries. And, worse I think they invite discussion among guests, when the only appropriate mood the CWGC should be setting is one of quiet personal reflection. There is a place for education, but it is in the days, ad hours before your visit, or after it. QR codes are an open invitation to keeping digital gear turned on inside the cemeteries. Even if I was alone at a quiet small out of the way cemetery with not another person in two miles, I’d be mortified if a cell phone alert went off in my pocket in such a hallowed place. Now that’s a discussion to be had over a beer or two, but I certainly respect your views, particularly on mobile phones in cemeteries! Gosh reading back through my comment on the information panels I was aghast at my you of “your visit” …. definitely did not mean “your” in the personal sense of you and Baldrick, but “your” in the general sense of the readership. I broke my personal rule about me never posting at midnight. Hope no offense taken. No, no. No offense at all. It really hadn’t occurred to me that your comment could be taken that way. Baldrick, of course, is an entirely different matter. It has come to my attention that he has spent the last twenty four hours on an alcoholic rage through the streets of the usually peaceful town of Wervik. Whether this has anything to do with your comment I have yet to ascertain. Funnily enough, although I quite understand your ‘never posting at midnight’ rule, and with regard to this blog, I have my own ‘you can always publish tomorrow’ rule that, if in doubt, I try to adhere to, if I didn’t post after midnight then, what with work and the missus and the animals, not an awful lot would get done on this site! I have a very cunning plan, Sir. Oooh. I am all ears Balders. I’m afraid I can’t say this over the interwires, Sir! And, sorry if my midnight rant was a bit over the top. While typing I was thinking of an incident a year ago when I found a YouTube video done by a quite talented football trickster from Ieper. (Your European football that is ) He had someone filming him doing tricks at various places around Ieper. 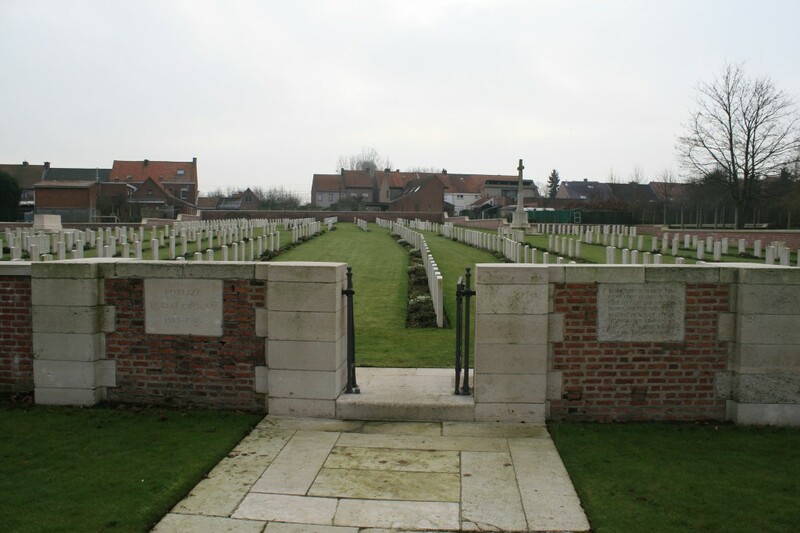 Sadly, one of the places they decided to film was inside Ramparts Cemetery at the Lille Gate. He was lying on his back actually on two graves keeping the ball up in the air. Very skilled, but very poor choice of venue. The video seems to have since been removed from YouTube. Perhaps I’m a bit over-reactive as a result to the decorum issue. How completely pointless. There’s a time and a place, surely. I will, however, make a comment about decorum, if I may. I have cried in cemeteries before now, more than once, but I have also laughed, and I make no apologies for so doing. I hope I do so again. I like to think that the residents don’t object. I refer you to the post on Hill 60 where I voiced my opinion about the kids tobogganing on what is a effectively a mass grave. But I appreciate that not everyone will agree with me. I told you it was a discussion to be had over a pint. 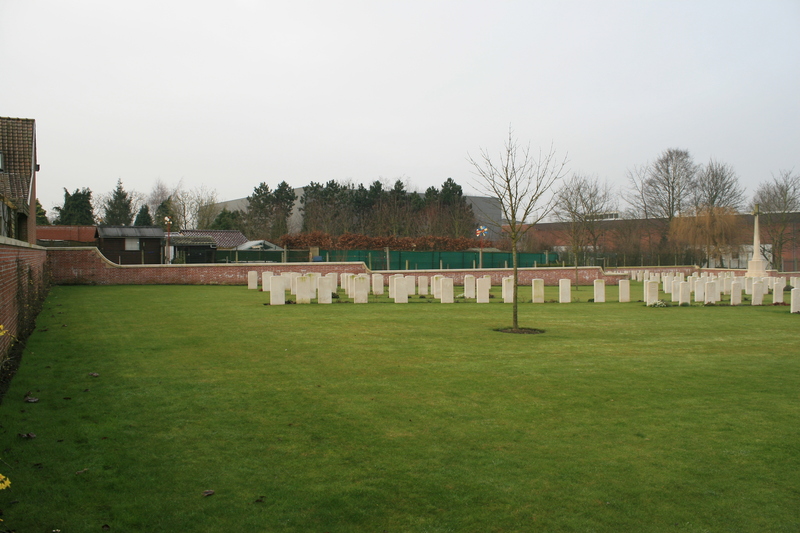 By way of atonement, I offer some information on the row of ten Scots Guards who fell on the 30th of March 1916, and rest together at Potijze. They were ten of 29 Scots Guards killed on the 30th March alone in a day long artillery barrage at Hooge. 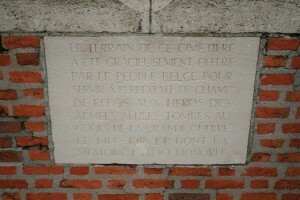 The Guards lost 750 men in March and April, again a large number falling to artillery. No atonement required, but information gratefully received nonetheless. Many thanks. I shall edit the post accordingly. Post updated John, Thanks again. Great info and well done on the whole project. Where did you get the details of the gas attack on the Hampshires from? Thanks for your kind comments Paul. Much appreciated. I am currently away from home, with only limited internet access (hence the delay in replying), but when I do get home I shall see if I can answer your question. It all depends whether my original notes for this post survived the flood (details elsewhere on this site), because I’m afraid I cannot remember off the top of my head exactly where I found the gas attack details. I do, though, check as thoroughly as I can before posting such information, I can assure you. It may take some time, but I will get back to you. Oh no it won’t. Take some time, that is. Through devilishly clever means I can confirm the sources as the 2nd Hampshire War Diary and a book entitled “I Survived Didn’t I?” by a Private Ginger Byrne, which has a good account of what happened that morning.